Boutique textile company, Frankie and Swiss, had struggled to find the right person to run ‘Florence’, their digital textile print machine. Eventually, they found a perfect match by taking on an Apprentice who already had a degree in Textile Technology and understood the demands of working with natural fibres. Frankie and Swiss was founded in 2011. They are a boutique textile company that custom print designs onto natural fibre fabrics with natural inks. Managing Director, Jacqui Redman, was not sure where to find their next person, or even what specific skills they needed, when their digital fabrics print machine operator left the organisation. She was hesitant to go to a standard online recruitment portal, as they knew the position required a very specialised skill set. In addition to small run clothing production, Frankie and Swiss manufacture homeware products including cushions, wall hangings and tea towels. 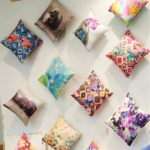 Their customers are typically interior designers, fashion designers or architects looking for bespoke fabrics and homewares. All manufacturing processes are handled in house, including any finishing work required. With this vacancy, Frankie and Swiss opted to take the apprenticeship path, hoping to find someone with a good knowledge of textiles and natural fibres, and willing to be trained to operate a digital textile press. The ideal person needed to have the right attitude and the customer service skills critical for the company’s ‘hands-on’ approach with their clients, in addition to being a machine operator and a designer. After interviewing “some interesting characters”, Jacqui came across Mareesha Van der Ploeg. Mareesha had completed a Bachelor of Applied Science in Textile Technology, and undertaken a number of different internships, including some with exposure to digital printing operations. Mareesha was taken on as a trade Apprentice in 2014, and found her place in the team quickly. She was already aware of the Frankie and Swiss product range and enjoyed the opportunity to have a hands-on role in an organisation with a strong sustainability focus. Natural fibre is notoriously difficult to print on with consistency so Mareersha’s understanding of how the fibres would respond to the print process was invaluable to the organisation. Frankie and Swiss’ commitment to skilling people in custom textile development processes has extended to the establishment of an internship program for textile design students. Schools partnerships have also been developed where VET in Schools groups visit the studio for a tour, learn about the range of natural fibres which are available, and work with the Frankie and Swiss team to produce their own samples. Another successful skilling sideline has seen the development of a Design School for people looking to further their knowledge and skills in textile printing. The majority of Design School attendees are undertaking some form of vocational qualification, such as fashion or textile design, and, through their association with Frankie and Swiss, can produce items required for their assessment portfolios. Mareesha’s ability to bring her textiles knowledge and understanding to the print production side of things has helped the business improve their range and product quality. She has recently moved to a production management role, with responsibility for customer liaison and all the finishing processes once the fabrics have been printed. With Mareesha on board, last year was Frankie and Swiss’ most successful ever and the future is looking very bright. When IBSA Manufacturing caught up with her, Mareesha was discussing the opportunities created by working with a new ‘silk lycra’ fabric. This fabric will further assist the organisation to expand into the boutique garment and sample production space. Embracing digital technology has also helped the business develop and thrive. 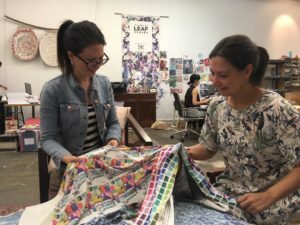 Frankie and Swiss are seeing growth in the Australian textile design industry. Having more competitors is actually helping the business grow as it increases their awareness of what can now be custom produced. Frankie and Swiss play a critical role in the development of emerging fashion designers and niche clothing production firms. They provide support, advice and an economical means of production to get their designs to market. Digital printing allows these designers to minimise their outlay with short runs, reduce their lead times to market, while allowing them to be responsive to changing market needs. The next evolution will be a new website that will enable clients to upload their own designs for direct product printing and manufacture using natural fibres, on products as diverse as deck chair covers to scarves. They are also looking to provide this web capability to third parties, such as photographers, to enable them to on-sell bespoke fabric prints of client photos for example.